Heat oven to 375°F. Unroll dough and separate into 8 triangles. In small bowl, mix raisins and lemon peel; spoon about 1 teaspoon raisin mixture onto short side of each triangle. Gently wrap corners of dough over filling and roll to opposite point; pinch to seal. Place point side down on ungreased cookie sheet. Bake 12 to 14 minutes or until golden brown. Remove from cookie sheet; place on wire rack. Cool 10 minutes. In small bowl, mix powdered sugar and enough milk until smooth and drizzling consistency. 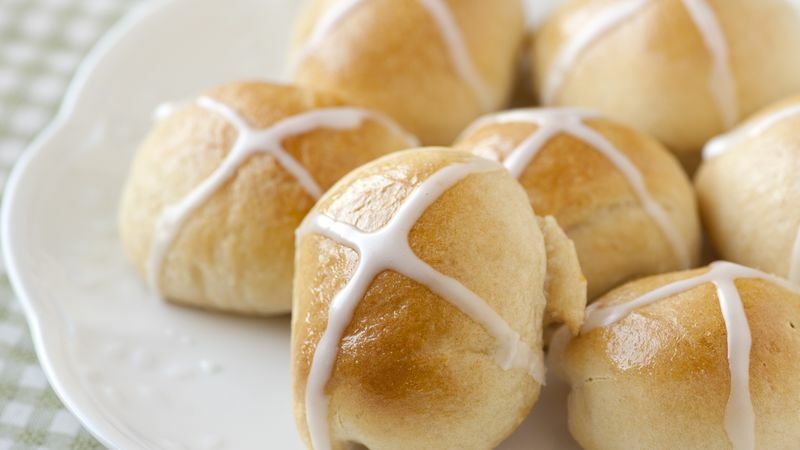 With spoon, drizzle icing in cross shape on top of each bun. Add a little extra color and a twist of flavor by substituting diced dried fruit and raisin mixture for the raisins.